Active landslides in clay shales are widespread in Mediterranean countries. One of their characteristics is that the mobilized shear strength corresponds to the residual strength. The residual friction angle of clays depends on pore fluid composition which, in formations of marine origin, could have changed after emersion from the sea because of a number of processes, e.g., contact with rain or fresh water. 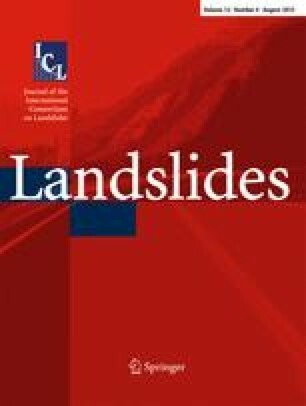 This study aims at evaluating the influence of pore fluid composition and of its changes on the behaviour of Costa della Gaveta landslide, used as a case study. The natural pore fluid composition was analysed; then, the influence of such composition on the residual strength, and the effects of its variation on the shear creep behaviour were investigated. The paper shows that the natural pore fluid is a composite salt solution with variable concentration. It exhibits characteristics close to those of seawater at about 30 m depth, whereas it is very dilute close to the ground surface. Salt solutions at various concentrations and distilled water were thus used to simulate in the laboratory tests the effects of the different natural pore solutions. The results show that the residual friction angle varies significantly within the field concentration range. Moreover, exposure to distilled water causes a noticeable decrease in the residual strength during tests under constant shear displacement rate. Consistently, under constant driving shear stresses, time dependent displacements are observed, evolving with primary, secondary and tertiary creep phases, characterized, respectively, by decreasing, constant and increasing displacement rates. An erratum to this article can be found at http://dx.doi.org/10.1007/s10346-016-0737-z. The authors would like to thank Mr. M. Belvedere for carrying out in situ measurements. The authors are particularly grateful to Prof. S. Masi and Mr. D. Molfese who carried out chemical analyses on the salt solutions. Part of this research has been funded by the Italian Ministry of Education, University and Research (PRIN project 2010–2011: landslide risk mitigation through sustainable countermeasures). Special thanks to Prof. Luciano Picarelli for inviting us to give a lecture on this topic at MWL 2013.